The Camden Historical Society's aim for this web site is to promote the local history and heritage of Camden, and its district. 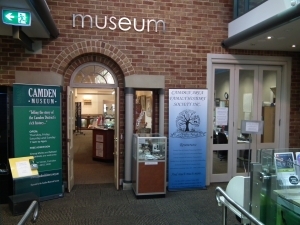 The Society manages the Camden Museum which is conducted entirely by volunteers, but receives substantial and continuing assistance from Camden Council. The Council has created an exciting cultural and heritage centre located in the heart of Camden's historic precinct. The Camden Library Complex hosts Camden Historical Society in the Museum, and Camden Area Family History Society in the Society Research Room next door to the Museum. The two Societies have separate identities but are in Partnership. They are closely affiliated because of their location and mutual working relationship with each other. They also have a working Partnership with Camden Council Library Services. Camden Council Library complex is the ideal place to visit for people interested in CAMDEN'S HISTORY. Camden Historical Society acknowledges photographs by Brett Atkins used on Camden History web site. A book of high quality photographs from the history of Camden and District is now available at the Camden Museum, Wollondilly Heritage Centre, and local newsagents. The book showcases the photograph collections of the Camden Historical Society and the Camden Council Library Service. High quality scanning has enabled the photos to be seen very clearly and in many cases in a larger format than seen previously. The publication is the combined effort of Dr. Ian Willis, Vice-President of the Historical Society, who has written the text and of Catherine Warne, an experienced Sydney publisher. Members of the Historical Society and staff from the Library have found the best quality copies of photos available to tell the history of Camden and its district. Many of the photos in the book are being published for the first time.